Getting into the inner sanctum, the fresh tuna auction, at the Tsukiji fish markets is rather like getting an invitation to the Queens garden party - no easy task. It’s all about who you know. The fish market is on most people’s must-see Tokyo list and most have to queue from as early as 1am for chance to be one of 60 people let in to watch the frozen fish auctions from behind a barrier after a two-to-three hour wait in a freezing holding room. 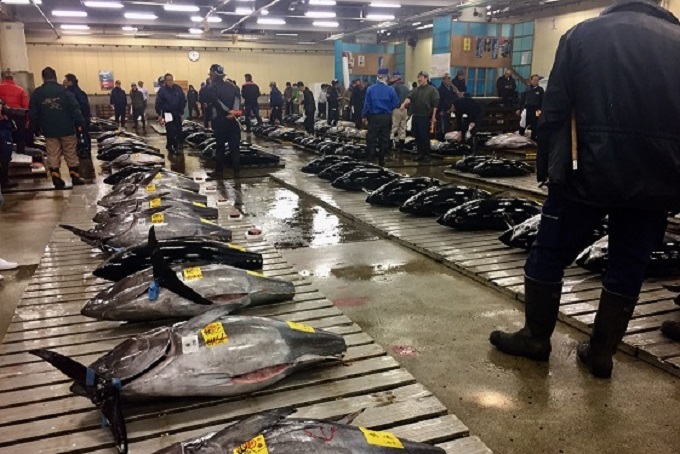 Getting in to wander freely at the fresh fish auction takes contacts – but it is worth it when you consider that one fresh tuna can go for up to $US40,000 (with the first catch of the year nearer $US I million) . No wonder fishermen call Bluefin (maguro) 'black diamonds’.